Ferry Corsten recently revealed the complete weekly line-up for Clandestin Presents Full On Ibiza. More than 50 names make up the entire bill, including Paul Oakenfold, Aly & Fila, Cazzette, Cosmic Gate, Markus Schulz and Ferry Corsten, who along with the rest of the team ‘promise to make the thunder of Full On sound louder than ever’. After an apparent successful first season at Space last summer, the night moves from Fridays to Mondays this season. Adrian Lux, Audien, Cazzette, Jacob van Hage, John O Callaghan, Markus Schulz, New World Punx, Paul Reynolds, Ummet Ozcan will also return again this year. Among the new artists are Spain’s DJ Nano, House South Brothers, Matan Zohar better known as Mat Zo, Emma Hewitt (live) and Orjan Nilsen. 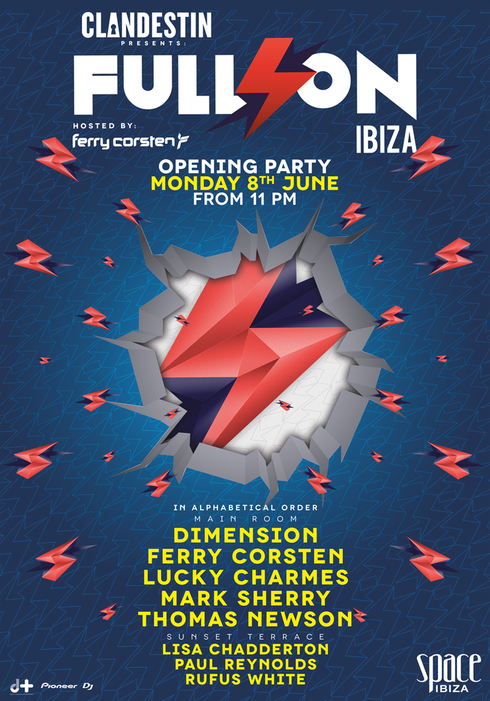 This party kick offs with an opening party on Monday 8 June, where clubbers can enjoy Lucky Charmes, Thomas Newson, Mark Sherry, Dimension and Ferry Corsten all in the Main Room. Meanwhile, Paul Reynolds, Rufus White and Lisa Chadderton will organise the Sunset Terrace to keep the rhythm flowing throughout the night.